Fact: it is easier to keep kids busy, engaged and calm in the mornings. If only we could do all the things before nine a.m. Including supper and bedtime. When my bigs were little (4, 2 and a newborn) I entered most days with optimism. We had a casual morning rhythm of stories and playing, often still in our collective pyjamas. Homeschooling at its finest. It was a full schedule of changing diapers, feeding little mouths and being together. And because we were still fresh, I had energy to handle the usual fusses and meltdowns. Theirs and mine. I would get everyone down for naps – at the same time, if the stars were aligned – and race around to deal with the urgent. As the day wore on, I grew weary and truthfully could have used a nap myself. 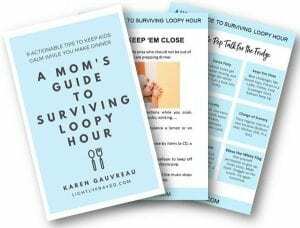 I would find myself dreading the upcoming Loopy Hour. That little pocket of madness slipped in between naptime and dinnertime. Where energy and needs boldly collide. When we are trying to stir the stir fry while the kids are stir-crazy. Or flip pancakes while they are flipping out. I’d attempt to multitask and referee from in front of the stove. I’d ponder my husband’s perfect existence. After all, he got to leave the house. Every day. By himself. And even choose his own tunes in a quiet commute in his crappy, heatless, leaky car. I suspect he took the long way home most days, before rushing in to be the hero of this tale. And who could blame him? Please tell me you can relate. Witching Hour (we grew up with Angel Eggs instead of Devilled Eggs, so I wouldn’t call it this – wink!). No matter what you call it, it can be brutal. I wish I could come to your home and be that extra set of hands you need. Your personal Nanny McPhee, without the mole. Perhaps this is the next best thing? While navigating a decade of Loopy Hours, I learned a few tricks. I became strategic in which toys to pull out and how I would structure our day. I discovered a way to prevent my toddler from wrapping his body around my leg (most days). I found simple, engaging activities to keep my kids busy and decrease sibling squabbles. And I wrote this for you. The book I wish I had once upon a time. It is filled with actionable tips. Simple ideas that can have a profound impact on this pocket of your day. And perspective from a Mom who has survived this stage and understands. Print the whole thing or read it online. The one-page Pep Talk is to tuck inside a cupboard. Refer to it often to spark your creativity and speak encouragement to your heart. 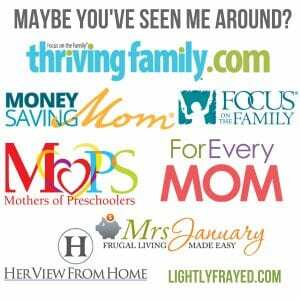 Know another Mom who needs a win? Something to lighten her load? Direct her here for her very own copy. You will be her hero. I’d love to hear which ideas work best to keep your kids busy while you make dinner. Comment below. Solidarity Mamas. Such valuable insight for moms. Thanks for sharing your heart and your experience. Passing this on to my daughters who are in the midst of mothering littles. Karen, this is such a great resource! 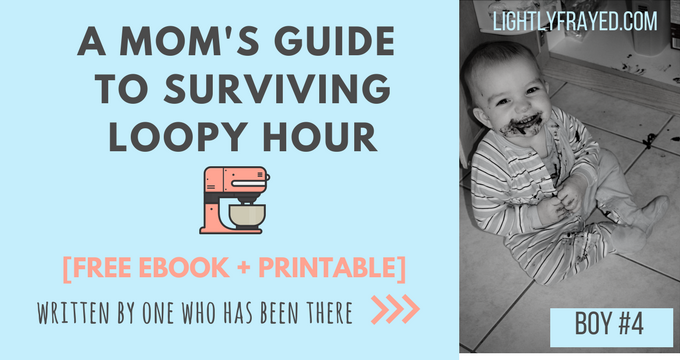 So easily digestible – which is perfect because us busy moms only have a few minutes to spare, as you know! I love the Pep Talk printable at the end that brings all the strategies together. Thanks so much!! 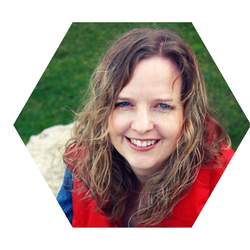 Hey Sarah – so glad you like this little ebook. I am hoping to put together others in the next few months. You are so right – when Mom’s don’t have time to go to the bathroom alone, they need small pep talks and condensed ideas. Bless you!